Think of the time you've spent at the butcher counter, staring. All those meat cuts. All those cooking methods. Just imagine knowing in advance how to pair them up. There are only a few magnificent beasts that we – how shall I put this delicately – kill and eat. And those, mostly, would be your cattle, your pigs, your sheep and your goats. These animals' anatomic similarities have allowed us to develop a cogent theory of meat cookery. "Meat", by the way, refers typically to muscle. Curiously, muscle is about three-quarters water. The rest is mostly protein, with smaller amounts of fat, minerals, steak sauce etc. Whatever meat we're eating, whether it's grilled steak or braised pork shoulder, we want it to be tender. And just so we're all on the same page, lingo-wise, "tender" means easy to bite through, easy to chew. The opposite of tender is tough. While meat can be tough for several reasons, the primary cause is the location it occupied while still attached to the animal. Location determines muscle structure, which, ultimately, determines cooking method. Regardless of location, every muscle consists of individual muscle fibres, which are long and thin and wrapped with connective tissue, like living cigarettes. Multiple muscle fibres are grouped together to form individual muscles that are held in place by yet more connective tissue. Here's a true thing: The more use a muscle gets, the bigger the individual muscle fibres get. Now, if you consider that something thick is harder to bite through than something thin, it stands to reason that meat with thick fibres is tougher than meat with skinny fibres. It's also true that much-used muscles need more connective tissue to hold them together and keep them attached to the bone. Imagine setting a graceful porcelain Lladro figurine atop your head. If you don't move, it could stay there indefinitely. Now, imagine the sudden appearance of an enraged ape. Your flight response triggered, you career across the street, sending your priceless piece to the pavement. Had you but strapped that Lladro down with a velvet sash, it could have stayed put no matter how rough the ride. Or think of fish: Because they're floating in water, they're not subject to gravitational forces the same way as land animals. Therefore, they don't need as much connective tissue. That's why you can eat salmon with just your fork, whereas even the tenderest chateaubriand requires a knife as well. Now, back to the muscles' location: Because all they do is stand around all day, the legs and joints of modern food animals, like cattle, get more exercise than their backs. Thus, those under-used muscles of the back, with less connective tissue and very skinny fibres, yield tender, finely grained cuts, while the well-used muscles of the legs and joints, with their thicker muscle fibres and more connective tissue, give coarse-grained, tougher cuts. Happily, some of that connective tissue – the kind called collagen – dissolves when subjected to heat. Tough cuts with lots of connective tissue – like pork shoulders or beef chuck roasts – do best, therefore, with low, slow cooking methods, such as braising or slow roasting. Over time, the collagen melts and the meat becomes, quite literally, fall-apart tender. That's why stews and braises can take hours on the stove. Tougher cuts can also be ground into mince – what we call "mechanical tenderisation" – because grinding makes meat easier to chew. It's why mother birds spit food into their babies' mouths. Naturally tender cuts – ribs, loins, all from the back of the animal – don't need long cooking times because they're already easy to chew. 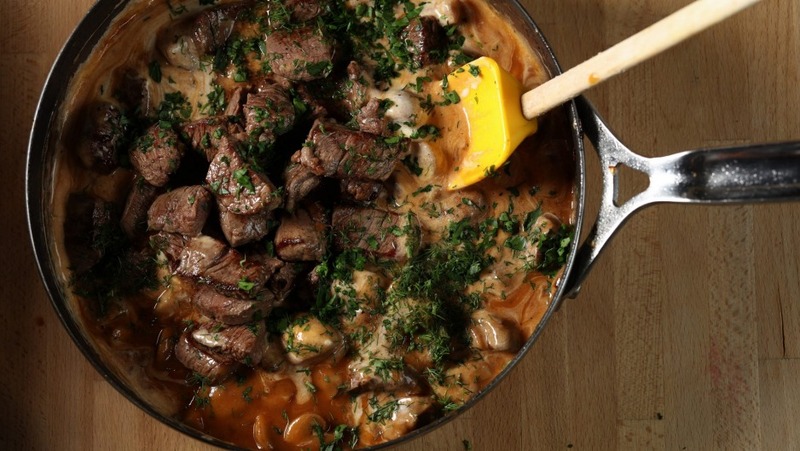 Beef stroganoff (see recipe below), made with tenderloin or other tender cuts, is cooked just long enough to meld the flavours, and steaks and chops can be seared quickly and eaten at medium or rare doneness. Finally, younger animals, because they haven't lived long enough to develop their muscles, are more tender than their older counterparts. Veal more than beef. Lamb more than mutton. Got it? Now let's go have some red, red meat. This recipe is one of my favourites. If you don't want to shell out the dough for tenderloin, sirloin works just as well and tastes nearly as good. 1. Place a large skillet over high heat. When hot, add just enough oil to cover the bottom of the pan. Add beef, and sear over high heat, stirring, until brown, 1 to 2 minutes. Transfer meat to a plate; reserve. 2. Add onion to the pan; saute until light brown, 1 to 2 minutes. 3. Add mushrooms; saute until dry and light brown, 1 to 2 minutes. 4. Off heat, pour in brandy. Carefully light it with a match. Place pan back over heat; stir until flames go out. 5. Add brown sauce (recipe below), bring to a boil, then reduce heat and simmer, 5 minutes. 7. Return pan to medium heat; bring sauce back to a simmer. Stir in cooked meat; reheat, about 1 minute. Stir in half the dill and parsley; season to taste with salt and pepper. Serve immediately over egg pasta, garnished with remaining dill and parsley. 1. Melt butter in a small saucepan over medium high heat. When foam subsides, add onion, carrot and celery; cook, stirring, until lightly browned, 2 to 3 minutes.